When oil and natural gas supplies in Michigan are discussed, Line 5 is never far from the conversation. My last IMPACT article examined the risks and rewards of transporting fuels via Line 5. I return to the topic because this key piece of Michigan’s energy infrastructure recently passed a federally mandated hydraulic pressure test. Even though the results of the pressure test were positive, the “shut it down” groups continue to demand that Line 5 be closed. But demanding the end of viable energy options offers no serious choices for energy developers, elected officials, policy experts or society as a whole. Anti-pipeline groups make clear their disdain for the entire length of Line 5 – from its beginning in Superior, Wisconsin to its end in Sarnia, Ontario. 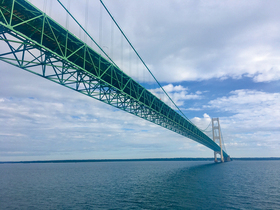 But the portion of Line 5 that receives the most attention is the twinned, 20-inch-diameter pipelines that move up to 540,000 barrels of light crude oil and natural gas liquids, or NGLs, daily across the Straits of Mackinac. Anti-pipeline groups demand Line 5’s closure, claiming that even the most remote risk of a leak into the Great Lakes is too great. But others recognize risk is an inherent part of human activity. Therefore, they actively work to minimize the potential for a leak, while still enjoying the benefits of affordable, abundant energy. For example, bipartisan congressional efforts passed the 2016 Pipes Act, federal legislation that requires intensive annual inspections of underwater pipelines. An independent contractor just completed hydrostatic testing on both underwater portions of Line 5 in a test that complies with the new law. The pipeline normally operates at 150 pounds per square inch and has a maximum operating pressure of 600 psi. The recent tests removed all oil and NGLs, filled the pipe with water and pressurized it to double its maximum operating pressure — 1,200 psi — for four hours. The pressure was then released and then returned to 700 psi for another four hours. This test actually exceeded federal mandates and mimicked tests completed when the pipe was first installed. No leaks, cracks or corrosion were discovered. Richard Kuprewicz is a specialist in designing and safely operating pipelines in sensitive and urban areas. Kuprewicz has often worked with environmental groups that seek to close other pipelines and has publicly criticized Enbridge’s operations in the past. But this test appears to have convinced him of the pipeline’s integrity. “You have a high degree of confidence that the pipeline has decent integrity,” he said, when this type of test is completed without any problems. Not all pipeline critics were convinced. Retired Dow Chemical Engineer Edward Timm has said calling for a shutdown is the “ethical thing for me to do … until the thing could be strip-searched.” He admitted the hydrostatic testing showed “the line will withstand the pressure it could when it was installed.” But then he called for what he termed a “better test” — a “volumetric hydro test to yield.” This new test would demonstrate the elastic properties of the pipe by pressurizing water in the pipe to 2,400 psi, actually pushing the pipe to the point where the steel begins to yield and swell under the intense pressure. Another critic, David Holtz, president of the Sierra Club’s Michigan chapter, panned the test in early June before it was even completed, arguing that “it’s hard to have confidence in anything that Enbridge does.” Following in Holtz’s footsteps, Sean McBrearty, with the environmental activist group Clean Water Action, admitted no test would change his group’s intentions toward the pipeline. "They can run water through the pipeline as much as they want; it doesn't take away the concern about the pipeline's safety from the things that have come out recently." He continued, claiming that Enbridge is “a corporation that can't be trusted,” and added, “It's a pipe we know can't be relied upon, and the water test should not have any bearing on the decision-making about whether to shut down this pipeline." No serious individual or organization ignores the potential damage an oil spill in the Great Lakes could cause. 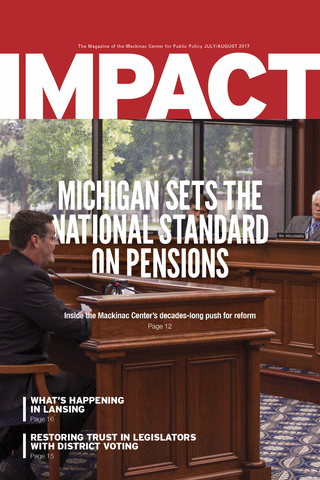 But Michigan’s elected officials and regulators are faced with intense pressures from two distinct directions. One side demands the closure of an essential energy infrastructure asset. Regardless of the impacts that closure might have on energy availability or energy prices, it maintains any risk is too great. Pressure on the other side comes from those who say that pipelines like Line 5 provide the state with essential energy and help keep the price of those resources low. Welcome to the Mackinac Center!